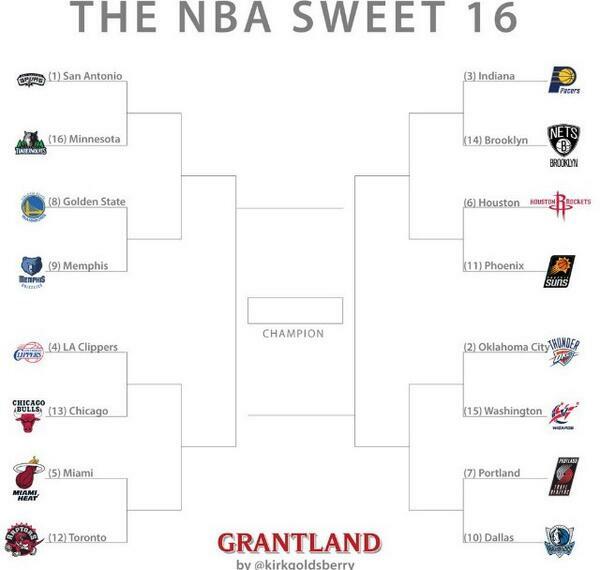 The East is one of the biggest joke of a conference in all of professional sports. The top 16 teams that have the best record, regardless of conference, should be in the playoffs. #1 plays #16...#2 plays #15...etc... It would be better. ^ I've probably been saying that the most on here than anyone. So much so that as much as I'd hope most or all agree, it's gotten' annoying, lol, but honestly, the NBA's so [expletive]ing pathetic & stupid. I cannot believe how idiotic they are on this. Top 16 [expletive]in' teams PERIOD. You get the best possible quality product you can get out on that floor for the game, the league, and the fans! Travel excuses are bull[expletive]!!! We're in [expletive]ing 2014 for cryin' out loud! & quit babying these guys, they get babied enough in today's game & money's not a [expletive]in' problem. Imagine that. How [expletive]in' sweet. Miami has to play Toronto (decent), then either Clippers or Chicago, both tough matchups, maybe the Clippers more, then OKC, & then either San Antonio, Houston, or Indiana. That is [expletive]ING AWESOME!!! Most of those teams right there would actually have a some decent to great shot at taking them out. Toronto & Chicago probably not, but even then, still potentially at least a solid fight, maybe wear em' down a bit. GREAT STUFF. No cakewalk boring uncompetitive bull[expletive]. GET YOUR [expletive] TOGETHER NBA. [expletive]ING MORONS!! !